Social media banking. Careers: FNB Bank Uploads Official Harlem Shake Video on Youtube to look like a cool employer, generate word of mouth and attract young talent. Earlier this month, I wrote an article entitled ‘5 Financial Services Harlem Shake Videos: Fun Bankers, Investors, Insurance Agents!‘ what I flagged some of the global financial services industry best shots at tapping the incredible popularity of the Harlem shake meme videos phenomenon. A week and a half ago, South Africa’s FNB Bank, one of the most innovative banks in the word under the leadership of its social media banking savvy CEO Michael Jordaan, published its own harlem shake video to be perceived as cool and attract IT talent. What do you think of our Mobile and Connect team doing the Harlem Shake? After social customer care and media relations, recruitment is one of the most obvious areas where social media can make an immediate impact in financial services. I invite you to read my older but still relevant article on the topic ‘5 Ways Banks Use to Build their Social Media Team‘. In the last few years, Standard Chartered repeatedly tapped social media with success with initiatives such as The Worlds Coolest Intern or the MoVe fellowship. Aman Narain, Global Head of Online and Mobile at Standard Chartered, and his colleagues managed to change their brand perception. Standard Chartered now has now the reputation of being one of the most innovative banks especially on mobile banking thanks to the Breeze team which demonstrates how fun it is to work for the bank. It is fair to say that this isolated ‘marketing coup’ from FNB bank doesn’t compare with Standard Chartered’s crowdsourcing strategy, but all things considered, the video is fun, isn’t it? Shame the location wasn’t more unusual or more “corporate”: watching those harlem shake videos is some kind of a guilty pleasure for me and thinking of my days working in innovation at a leading UK bank, I wonder how all those video directors got the go ahead from their Management to record the fun videos in their office and publish them on youtube. 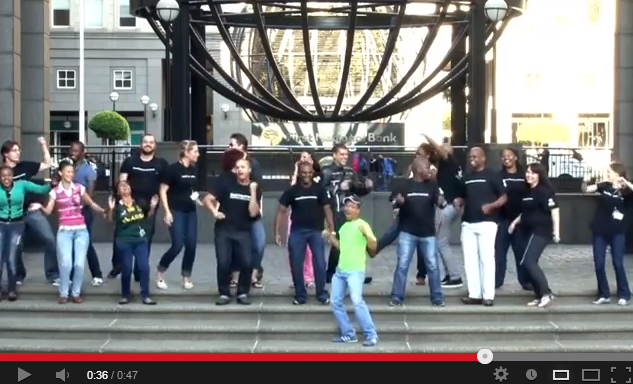 So, how fun do you find this harlem shake video from FNB Bank? Having in mind the clear call to action, does it make this fun effort look fake? If not, would it urge you to check their job openings and possibly apply?